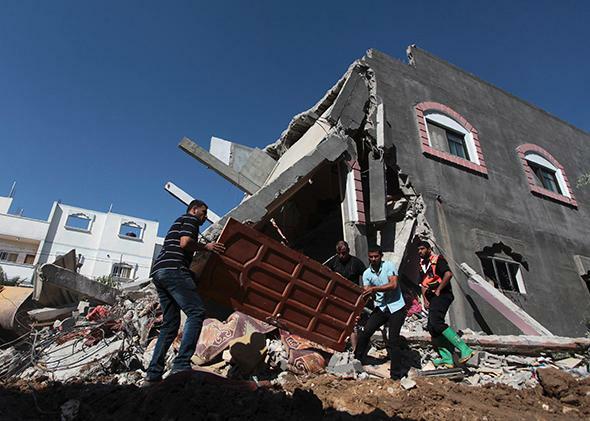 Gaza civilian casualties: While Hamas targets innocent people, Israel tries to spare them. Israel, unlike Hamas, isn’t trying to kill civilians. It’s taking pains to spare them. Palestinians carry a door from a destroyed house following what police said was an Israeli airstrike in central Gaza Strip on July 9, 2014. The charges are false. By the standards of war, Israel’s efforts to spare civilians have been exemplary. West Bank. But arrests in one territory don’t justify aerial bombardment from another. Israel didn’t hit Gaza until terrorists had fired more than 150 rockets into Israel and had rejected a cease-fire. Some of the pictures that purport to show devastation from the Israeli strikes are fakes borrowed from other wars. As of Wednesday afternoon, the death count ranged from 30 to 50 or more, depending on where you mark the onset of the conflict. Every death is tragic, and the longer the assault goes on, the higher the toll will go. Still, given that Israel has launched more than 500 airstrikes, you’d have to conclude that either Israel is failing miserably to kill people or, more plausibly, it’s largely trying not to kill them. Israel’s defense minister admits his forces have targeted “terrorists’ houses” as well as “arms, terror infrastructures, command systems, Hamas institutions, [and] regime buildings.” The houses belong to Hamas military leaders. An Israeli official boasts that “there’s not a single Hamas brigade commander that has a home to go back to.” Israel’s legal rationale for targeting these homes is that they were “terror command centers” involved in rocket fire or other “terror activity.” But while Israel has tried to kill commanders in their cars (and has succeeded), it has avoided unannounced strikes on their homes. The last time Israel targeted buildings in Gaza, a year and a half ago, it used leaflets and phone calls to warn residents to get out beforehand. It also fired flares or low-impact mortars (known as a “knock on the roof”) to signal impending strikes. Human rights groups didn’t accept these measures as protection from legal responsibility, but they did hail them as progress. Israel claims to be applying the same measures today. Hamas and other Palestinian sources confirm that the Israeli military has issued phone warnings to families in the targeted homes. Smoke following an Israeli airstrike in Rafah in the southern Gaza Strip on July 9, 2014. Human shields are a difficult problem. Israeli Prime Minister Benjamin Netanyahu says Hamas is responsible for civilian deaths in Gaza, because it deliberately sets up rocket launchers and military infrastructure in civilian areas. That excuse is too broad. 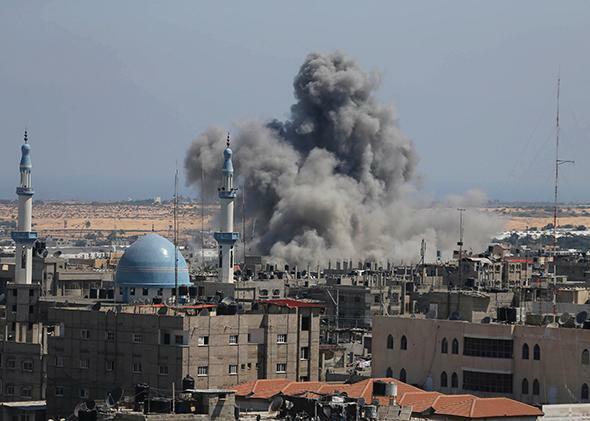 The low death rate in this week’s airstrikes—and the explanations from Israeli officials as to how the casualty rate has been minimized—show that it’s possible to degrade Hamas’ military assets without killing hundreds of people. The Khan Yunis scenario is different. There, the human shield was voluntary. According to Ha’aretz, an Israeli officer insisted on Wednesday morning that if other civilians followed this example—responding to prestrike warnings by going onto the roofs to form human shields—Israel wouldn’t be deterred. Maybe the officer was bluffing. But what if this scenario happens again? And what if the would-be martyrs appear on the roof while Israel still has time to avert the strike, which wasn’t the case in Khan Yunis? Would their deaths be homicide? Would they be suicide? That’s a tough call. But anyone concerned about the deliberate targeting of civilians in this conflict should first look at Hamas. The rocket fire from Gaza into Israel began well before the Israeli assault on Gaza. Initially, the rockets were Islamic Jihad’s idea. But in the last few days, Hamas has joined in with gusto, claiming credit for missiles fired at several Israeli cities, including Tel Aviv, Jerusalem, and Haifa. I’ve criticized Israel for demolishing the West Bank homes of suspected Arab terrorists. That policy is indefensible. But in the Gaza war, it’s clear that Israel has gone to great lengths to minimize civilian deaths. The same can’t be said of Hamas.